This document is the project plan updated to December 2017 including the challenges to be address in the final year of the project. This is a public deliverable and could be read by anyone but is primarily for the benefit of the project team to help coordination and as a record of intended progress in the next 6 months. We assume the audience is familiar with television and Internet technologies. This document will be read by the Project Consortium as it implements the infrastructure and the trials to be delivered during the project. For a multidisciplinary and multicultural collaborative project like 2-Immerse, quality assurance of its deliverables and publications is very important. This deliverable describes the high level quality assurance measures that the 2-Immerse project intends to apply. The details of the quality measures of the technical components and the 2-Immerse software are outside the scope of this deliverable and described in the particular technical deliverables. Besides 2-Immerse internal quality assurance mechanisms there are regular and irregular reviews and audits performed by the European Commission. These are planned and controlled by the Commission, and are not the main subject of this deliverable. However Annex B gives an overview of the Commission performed reviews and audits. 2-Immerse team members, the Project Officer from the European Commission, 2-Immerse reviewers and auditors. This Data Management Plan (DMP) describes the data management processes and all of the data processed as part of the 2-IMMERSE H2020 project. It describes the data management life cycle and is part of the 2-IMMERSE Consortium’s effort to make research data findable, accessible, interoperable and re-usable (FAIR). Good research data management leads to knowledge discovery, innovation and extraction of new valuable information. This document provides a final check on whether initial data management plans (as described in this integrated document) have been adhered to, and measures that are implemented to identify processing of personal data and to ensure that each consortium partner is aware of its obligation to comply with new data protection legislation such as GDPR. This plan also includes details of some measures adopted by the consortium as a whole to minimise personal data and to mitigate data protection related risks. This document describes the system architecture being developed by the 2-IMMERSE project. This architecture is designed to enable the four multi-screen service prototypes that will be delivered through the project. The System Architecture is layered as a set of platform services, a client application architecture and production architecture. The system architecture is a work in progress; it will evolve both as we refine it and specify it in more detail, and as we deliver each of the multi-screen service prototypes through the project. This document specifies the interfaces of platform components defined in the 2-IMMERSE project system architecture. As such, it is a refinement of the System Architecture defined in project deliverable D2.1, providing a more detailed definition of the platform components and services. This architecture, platform, and its components are designed to enable the four multi-screen service prototypes that will be delivered through the project. This document describes the first release of the 2-Immerse Distributed Media Application Platform, Multi-Screen Experience Components and Production Tools that have been developed for the project’s first service prototype, “Watching Theatre at Home”. It provides an illustrated tour of the project’s technical achievements to date, along with details of the current status of the platform and components and key features developed beyond those described in deliverables D2.1 and D2.2. Although originally defined as two separate deliverables, D2.3 (Distributed Media Application Platform: Description of First Release), and D5.1 (Multi-Screen Experience Components: Description of First Release), these have been combined into a single document which will be easier to read and navigate. 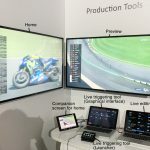 This document describes the second release of the 2-IMMERSE Distributed Media Application Platform, Multi-Screen Experience Components and Production Tools that have been developed for the project’s second service prototype, “Watching MotoGP at Home”. It provides an illustrated tour of the project’s technical achievements to date, along with details of the current status of the platform and components and key features developed beyond those described in deliverables D2.1 (1), D2.2 (2) and D2.3 (3). The description of the second release was originally defined as two separate written reports: D2.4 (Distributed Media Application Platform: Description of Second Release) and D5.2 (Multi-Screen Experience Components: Description of Second Release). To make the content easier to read and navigate, the complete description is now provided in this document, D2.4. Deliverable D5.2 now contains a series of videos which show the 2-IMMERSE Platform, Components and Production Tools in action. This document describes the final release of the 2-IMMERSE Distributed Media Application Platform, Multi-Screen Experience Components and Production Tools that have been developed for the project’s four service prototypes. At the end of the project, this release represents the most mature and robust implementation of the platform, components and tools with the functionality required to deliver all of the service prototypes, and in particular the three which have been completed during the final year of the project: Football Fanzone, Football at Home and Theatre in Schools. This document first describes the public software release of the 2-IMMERSE Platform for the Development of Distributed Media Applications, Multi-Screen Experience Components and Production Tools. With these open-sourced software components, the community should be able to deploy their own 2Immerse platform and run similar distributed media applications. This document further describes a reference architecture, called DMApp-RA, for distributed media application platforms. This abstract architecture is derived from our 2Immerse platform, and reflect the knowledge and insight obtained through our own platform-building experience in this domain. The reference architecture is shaped by our original platform architecture, the platform design and implementation choices, the chosen set of experiences, which represent a wide range of domains, and the technology and feature choices made implementing those experiences. The project parties believe this abstract architecture specification will be a useful guide for the community to generate architectural blueprints for their own Distributed Media Application platform, and defines a useful nomenclature for the domain at large. This document outlines the concepts at play in the design of the multi-screen experiences under development in 2-IMMERSE for the project’s four pilots. Here we outline the types of experiments and the decisions they are intended to inform within and across the four scenarios of drama and sport in private and public venues. This document describes the user interaction design and experimentation work that has informed the potential design of Theatre in the Home service experiences and specifically the subset of those features to be tested with connected audiences in private homes. Some of the design challenges and the resulting experiments may also inform future service trials in the project. This document describes the User Interaction Design for the various scenarios based on user testing results. The document will be continuously updated throughout the project. 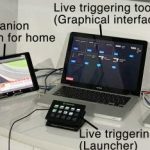 The current version describes MotoGP user interactions which builds on the previous design responses for Theatre at Home. It describes the development of generic components & features to inform MotoGP Service Trials, Production Tools, and OnBoarding. 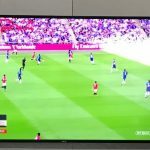 This document describes the results of user experiment tests that led to the development of the Football based experiences and includes the FanZone experience, an at home experience and the development of the production tools that supported the live production of the multi-screen experience of the 2018 FA Cup final from Wembley. This document also records the results of user experiment led development of the OnBoarding functionality that led to the creation of the Unified Launcher. features used in all the service trials. The four multi-screen service innovation prototypes that will be developed by 2-IMMERSE are described in this document. They are called “Watching Theatre at Home”; “Watching Theatre at School”, “MotoGP at Home” and “Watching Football in a Pub”. For each service innovation prototype the market context, the social context and the trial plans are described. Whilst the use cases are described very specifically, it seems clear that many aspects of service innovation concepts will have much broader applicability. D4.2 Theatre trial evaluation results The document considers the first Service Prototype created by 2-IMMERSE and evaluates both the experience itself and the generic platform that we used to support this service. The software platform is a micro service based platform that has provided the means to create a fully-fledged social inter-home multi-screen TV experience based around watching a theatre performance ‘as-live’. The experience uses two devices, provides additional material and information, and allows people to communicate from different locations (video and chat based). The evaluation focusses on our experience with the platform but includes detailed finding from an extensive, highly situated user trial involving more than 35 people in more than 23 homes based on 12 distinct trials. The document reports the method of evaluation the results and identifies a number of key findings and recommendations for future work that are reported as conclusion and plans. The fundamentals of the micro-service based approach to building the platform are very strong though more work is needed to improve robustness and to make it easy for producers to create new experiences. We also found that users would have like more ability to control the layout of the service as offered to them. D4.3 Prototype Service Descriptions - First Update The four multi-screen service innovation prototypes that will be developed by 2-IMMERSE are described in this document. This is the first update to a previous deliverable that brings up to date the visions the project has for each of the four innovation prototypes. The four prototypes are called “Watching Theatre at Home”; “Watching Theatre at School”, “MotoGP at Home” and “Watching Football in a Pub”. For each service innovation prototype the market context, the social context and the trial plans are described. Whilst the use cases are described very specifically, it seems clear that many aspects of service innovation concepts will have much broader applicability. The four multi-screen service innovation prototypes that are being developed by 2-IMMERSE are described in this document. This is the second update of this deliverable. It brings up to date the visions the project has for each of the four innovation prototypes. The last status report was May 2017, this document was compiled in December 2017. The four prototypes were originally called Watching Theatre at Home; Watching Theatre in School, MotoGP at Home and Watching Football in a Pub, as you will see from the text the fourth is now Football at Home. Whilst the use cases are described very specifically, it seems clear that many aspects of service innovation concepts will have much broader applicability. To complement this written document readers are also alerted to look at videos available on this website. This document describes the evaluation of a multi-screen MotoGP experience designed to be watched at home. The prototype is based on the UK round of the 2017 MotoGP championship that took place at Silverstone race circuit. The content assets used to create the ‘as live’ experience were provided by Dorna Sports and are used under license by the project. The 2-hour experience was evaluated by MotoGP fans in their homes using a small dedicated computer to act as the set top box that accessed a cloud based service based on a constellation of micro-services. Ninety three user responses have been assessed through quantitative assessment of the experience accompanied by qualitative responses elicited through a guided interview procedure. These responses were also compared with log based data collated using google analytics. Users’ impression of the overall experience and their assessment of particular features in the experience have been evaluated. We were encouraged by the responses. A significant majority (about 70%) of the responses indicated a preference for the multi-screen presentation over the normal broadcast presentation. 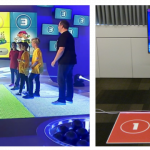 There were many reasons cited as to why the multi-screen version was better but features that were repeatedly mentioned ‘more interaction’, ‘additional camera views’ and ‘more information’. • ..[you have] more info more engaging can do it with friends. • …it’s more exciting than ..watching it on TV … I felt more involved. appear consistent with the brand goal of helping viewers “get to the heart of sport”. Tentatively we conclude that the multi-screen experience developed here would be enjoyed and recommended by a significant majority of our target audience (viewers of MotoGP on TV). 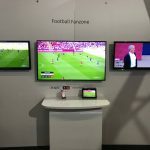 Analysis of the annotated responses suggest that the new features enabled in this multi-screen experience are consistent with the goal of BT Sport to create services that allow users to “get to the heart of sport”. and rendering on-screen graphics and the system for generating and configuring the live broadcastobjects. the Donmar Warehouse and are used under license by the project. dedicated computer to access a cloud based service based on a constellation of micro-services. workshop leader through structured interviews and discussion group. Anyone interested in building or learning about new multi-screen experiences. project’s YouTube channel, which can be found by searching for “2Immerse” on YouTube. The second iteration of this document presents how the results of the 2-IMMERSE project are and will be exploited. It sketches a plan for exploitation by identifying the potential assets that shall be made available outside the project and it gives an overview of the different mechanisms how this can be achieved. An overview of dissemination activities of the first 24 months is given and a plan for future publications, talks and presentations of project results. Partners in 2-IMMERSE are very active in relevant standardisation bodies, the document includes an overview of these activities which could be used to contribute project results into standards. This is the second report of 2-IMMERSE work package 6. This document provides an update of the 2-IMMERSE project exploitation and dissemination activities that was previously described in deliverable D6.1. The exploitation assets that have been identified in D6.1 are updated and enhanced with partner specific exploitation plans. An overview of dissemination activities to date is given together with a plan for future publications, talks and presentations of project results. From the standards perspective we regard the relevant parts of DVB and HbbTV standards for multi-screen applications as being stable, with a focus on supporting-actions like the test suite. A related activity in MPEG has emerged since the publication of D6.1, MPEG MORE - Media Orchestration. Based on an internal analysis of current drafts, the standardization section gives a brief summary about where we, may contribute to MPEG MORE, though we only anticipate such contributions being sensible towards the end of the project. This is the second report of 2-IMMERSE work package 6. A final update of this document will be issued before the end of the project. dissemination activities and standardisation efforts. It is an update of deliverables D6.1 and D6.2. reflect the latest ambitions, project results and activities. a future evolution of those specifications.